Before the V12 came the straight-six. Originally Sir William Lyons wanted to launch both cars at the same time but just weeks before the launch in September 1968, Jaguar had to concede that the V12 engine was not ready and the XJ6 went on sale with the straight-six offered in 2 sizes: the 2.8 and the well-known 4.2 from the E-type. The XJ6 received rave reviews but there remained a sense that the best was yet to come. Having come so tantalisingly close in 1968 it was another 4 years until the V12 was fitted to the XJ bodyshell. Punishing new safety requirements had caused the delay but now with 12 cylinders, the XJ was the undisputed king of the saloons. Success for the XJ series was instant. The factory in Coventry set about producing 25,000 cars a year with 56% being exported, showing how well regarded and in-demand this new British saloon was. The car currently offered for sale at The Classic Motor Hub is the rare long wheelbase version (hence the “L”), of which only 754 were built out of a production run of some 82,000 Series 1 XJs. A key requirement of the new saloon car was to offer the comparable level of luxury of a Rolls Royce Silver Shadow for the price of something closer to a Ford Granada. With that in mind the engineers spent several years working on the noise vibration and harshness (NVH). Engineer Bill Heynes and his team studied what created road noise and set about eliminating it from the cabin, using 5 different kinds of synthetic and natural rubber in the suspension top mounts, engine mounts and the subframe. For the first time in Jaguar’s history a comprehensive study of every component of the car was undertaken to see how it could be improved to maximise the driver’s comfort while driving. Different sizes of tyres were tested to record the differences in road noise and experiments were carried out on the path the exhaust took down the length of the car to minimise noise. All this contributed to a giant leap forwards inside the cabin. This particular Jaguar XJ12 is in fantastic original condition with no modifications and has been wonderfully cared for. Cosmetically the car is very honest and has plenty of character but the interior is truly fantastic with complete originality. The leather seats are distressed just the right amount and are still superbly comfortable with no sign of the padding degrading. Luxury cars today tend to be bolstered to be supportive around the sides but the seats in the XJ12 have no such support and in many ways are all the better for it. 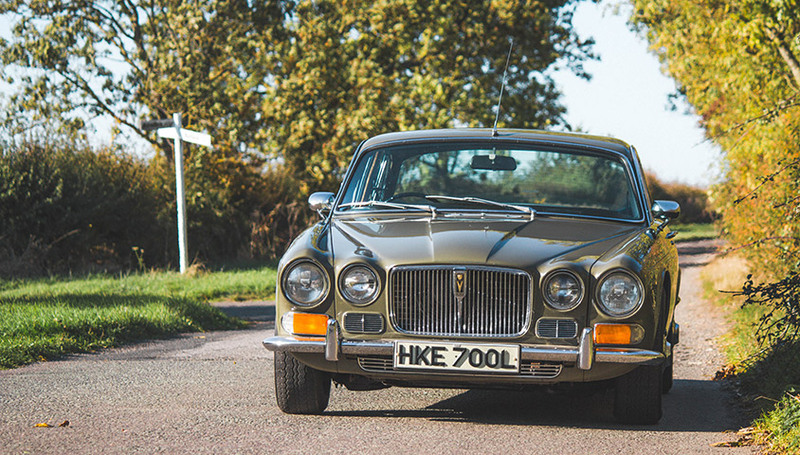 The XJ12 has a charming old England aesthetic about it. The bonnet protrudes over the top of the headlights like old man’s eyebrows and the chrome ring around each headlight looks like wire-rimmed spectacles. Inside the car, the swage line of the bonnet tapers into a V and helps guide the eye down the road. The generous array of instruments, dials and rocker switches are reminiscent of a war-plane, particularly with this Green Sand example. However, don’t be fooled by the gentle lines of the Jag, every now when approaching the car you’ll catch a glimpse of the V12 badge, reminding you of what lies underneath the bonnet. To get the big Jag rolling a little choke is required and a couple of pumps of throttle to prime the carbs, after which the engine cranks slowly before catching and settling into a smooth idle that only a big V12 can. The gear selector again feels like the throttle of an aircraft as you pull back to select drive with your foot firmly on the brake. There is a lot of torque to this engine and so merely resting your foot on the brake will result in you lurching forward, which to my horror nearly resulted in me hitting an Aston Martin DB7! Out on the road the XJ is a sweetly set up car. The steering is very light, which at the time of its launch was one of the few criticisms at a time when electric steering was not as common as it is on today’s cars; the result is a car that has a very light feel and is superbly accurate. On the way into a fast corner you can feel the mass of the car pitching in but there is surprisingly little body roll. However, as mentioned earlier the design team intended this car to be as similar to the E-type as possible and so the XJ cars used several parts developed from the E-type and the S-type such as independent suspension on all corners. This meant that the system had several years of development by the time it was fitted to the XJ12 and so the car controls its mass very effectively and gives it the handling of a sports car without compromising the ride quality. The tendency in modern cars is it to try and hide every bump and engineers are obsessed with damping out the car’s response to the road and to minimise body roll which, in my opinion, results in a harsher ride. However, I find the old approach of absorbing bumps with large suspension travel to be far more comfortable. In the Jag, the smaller bumps are completely swallowed up by the wider profile tyres and independent suspension while the larger compressions in the road surface are handled with grace by the softer approach to damping. However, the centrepiece of the car is obviously the V12 taken straight from the E-type. At idle the car is eerily silent and super smooth. There is obviously plenty of power to give from the big V12 but it doesn’t explode out of the corners, instead it seems to gird its loins and let the 3-speed Borg-Warner automatic gearbox carry you down the road on a seemingly endless surge of power. The engine is very quiet throughout the rev range but at about 4000rpm you can hear a little snarl of induction noise as all 4 carburettors are wide open, reminding you of the exotic nature of the jag. The XJ12 exhibits all of Jaguar’s brand values in one single model; strong performance, refined interior, sporty handling, comfortable ride and understated good looks. The car currently offered for sale at The Hub should be a serious consideration for anyone looking for a car to smoke about in. It fits four people in absolute comfort and – as you can see – is ideally suited to take to the pub. For many years the Jaguar XJ12 has been somewhat forgotten but with the 50th anniversary of the XJ6 which started the model line, attention has again turned to the original XJ and with several magazines featuring the car in recent months, values of this special Jag are set to rise as people once again realise the significance of the original big Jag V12.